How-to video about how to set-up and use a chafing dish from your local party rental. If you rented the chafer from ASAP Tent and Party Rentals you will find a printed instruction sheet inside. If you rented from some other company these instructions should work for you. Download the Chafing Dish Instructions sheet. 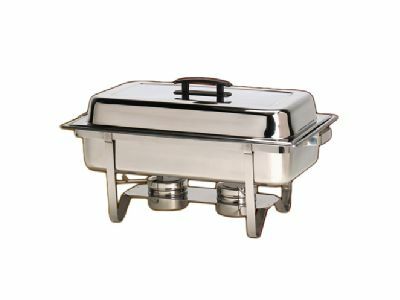 All chafing dishes, or chafers for short, have three main elements, a frame, a water pan and a cover/lid. Regardless of the type or size, they use water as a medium to transfer heat from the heat source, typically one or more sterno, to the food pan. Always make sure that the chafer has adequate water to prevent burning and equipment damage. Chafers should not be used for cooking food, they are meant to keep food hot or warm. For best results, heat your food in an oven and use the chafer to keep food warm. To start assemble the chafer, begin with the frame. If the frame has multiple pieces, ensure that all parts are put together properly and the unit is stable and level. Insert the water pan into the frame, the water pan will have an inset “lip” around the rim. After assembling the chafer, fill the water pan with about ¾” to 1 ½” of water. Insert the food pan(s). For proper heating, the gaps around the lip of the water pan should be completely covered. For example one chafer should have one full pan or two half pans. If a chafer has only one half pan and the other half of the chafer is uncovered, the water will evaporate out of the water pan and can lead to improper heating and/or soggy food. Once the food is set in the chafers, pry the lid off of the sterno and use a match to light. Check the label of the sterno to see approximately how long they will burn. Place the sterno under the water pan and close the lid. If your chafers are outside, wrap aluminium around at least three of the sides to block the wind. Use tongs to replace the old sterno – they will be hot. Sterno burns quicker if outside. Use an oven mitt when lifting or tilting the unit, if you hear a sizzle, add more water. When the food is not being served replace the lid. If you think the food is getting too hot, use only one sterno. This entry was posted in How-to and Style and tagged chafing dish, client support, event rentals, how to video, instructions, party rentals, video. Bookmark the permalink.